The town and RE/MAX came to a five-year agreement under which RE/MAX will be providing $25,000 for the RE/MAX Community Court at Bradley Park. 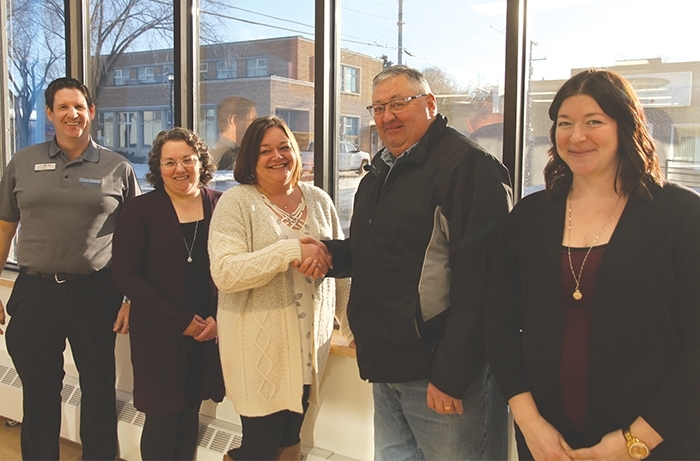 From left are Councillor Murray Gray, Rolna Pranke and Lynn Fawcett with RE/MAX, Mayor Larry Tomlinson, and Catherine Mannle with the Moosomin rec department. Rolna Pranke and Lynn Fawcett, Moosomin’s two RE/MAX agents, are contributing to improvements at Lloyd Bradley Park. RE/MAX will contribute $25,000 over the next five years to develop RE/MAX Community Court, an area to the west of the main concession and east of the Elks Diamond. “RE/MAX contacted us a few months ago and came up with a proposal for a project,” says Moosomin Rec Director Mike Schwean. “We’re going to close the road between the main concession and the Elks Diamond at Bradley Park, and turn that into a nice sitting area where we can serve out of the concession, and people can watch ball games. We’ll have some furniture, some irrigated grass, we’ll have it fenced off so we could have a beer gardens in there. “We did a lot of work on our main concession last year, so that’s going to be a better facility than it has been for the past few years. RE/MAX has committed to funding it over the next five years, so we can work away at it over that time. We don’t really have a nice seating area close to the ball diamonds. The Eventplex is nice, but it’s not close to the ball diamonds, so when we have provincials or a ball tournament, it will be nice to have this spot for people to sit and enjoy the day. Mayor Larry Tomlinson says the help of the community has made Bradley Park what it is. “We’ve had so many service clubs take on a project, so many businesses willing to sponsor a project or donate for naming rights, it’s been great,” he says. “I’ve had lots of comments from people saying we have city facilities in a town, and we really do, and that’s thanks to Mike and Catherine. A quick look around Bradley Park shows how many groups and businesses have been involved—the Moose built Guinness Field, the first lit ball diamond, The Elks have their diamond, the Kinsmen developed Kin Field, the second lit ball diamond, Diamond 8 is known as RONA field because of Mullett’s RONA’s support, the Generals have developed the Battlefield, Moosomin United has developed the soccer field, the Rodeo Committee has made huge improvements to the rodeo grounds, and the generosity of corporate donors is seen in the Conexus Convention Centre, the Nutrien Sportsplex, the Tim Hortons Outdoor Eventplex, and Borderland Co-op’s Murray Newman Field. “We have people like RE/MAX and all the others who help us develop parts of the park, and there is so much pride and ownership in the facility,” says Mike. “In the old days when I first came here, it was almost a place for kids to go and get in trouble. Now there is so much community ownership. Everything is well looked after by our patrons because of that. Everyone feels a sense of ownership, and that’s huge.